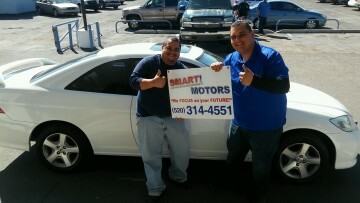 I was nervous about my past credit history and felt relieved and grateful Smart Motors could help. I felt like I would never find a car! Smart Motors met my needs and I drove away happy. I was stressed and anxious before visiting Smart Motors. They had an awesome team that worked with my needs and budget! I’m stress free and relieved! 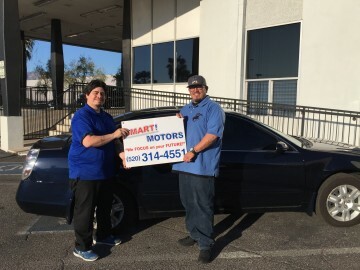 If you’re looking for a used car in Tucson, Smart Motors is your smartest choice (pun intended). 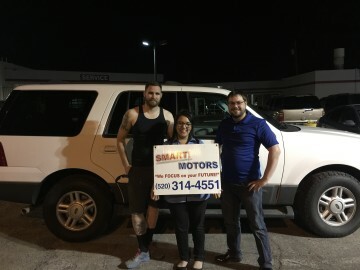 With a large selection of family-friendly SUVs, sedans, and more, we’re bound to have a vehicle for you! Whatever you’re in the market for–from Ford to Toyota and Chevy to Honda–we’ve got a full-stock of dependable vehicles. With our quick and easy finance application, Tucson shoppers in the market for a used car can ride off in a reliable new-to-you car! We have payment options available for many credit scores and/or financial situations. We even offer ONE DOLLAR delivery in many cases to make things as easy as possible!